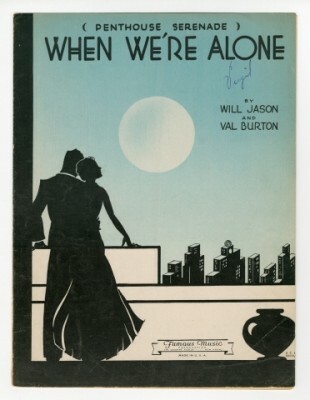 “Penthouse Serenade” is one the classic Depression-era songs with the yearning for the glamorous Manhattan apartment by the poor, yet romantic, couple. The first known use of “Penthouse Serenade” was for the 1933 animated short Betty Boop’s Penthouse, where it was sung by Mae Questel. On a more serious note, “Penthouse Serenade” has had exceptional recordings: Nat King Cole recorded it in 1952 as a piano solo for an album of the same name and Tony Bennett’s recording for his 1959 album Hometown, My Town is really wonderful with a brilliant arrangement by Ralph Burns. Penthouse Serenade was recorded on November 6, 1958 and was released in 1959 on the album Hometown, My Town. It was arranged by Ralph Burns.